Apple’s upstream suppliers have begun shipping components for next-generation iPhones recently and Pegatron Technology is estimated to have landed half of the orders for the 4.7-inch model, indicating that Pegatron may supply 25 million of the estimated 50 million 4.7-inch next-generation iPhones shipped before the end of 2014, according to sources from the upstream supply chain. Last May, Pegatron’s production share for the 4.7-inch iPhone 6 was reported to be as little as 15 percent. Then, in June, it was pegged at 30 percent, with the other 70 percent said to be handled by Foxconn. But now, the orders for the 4.7-inch model are said to have been split evenly between Apple’s two main iPhone assemblers. Apple is expected to hold a special media event on Sept. 9 to unveil the iPhone 6, which is widely rumored to come in 4.7-inch and 5.5-inch versions. The larger iPhone 6 model is said to be manufactured exclusively by Foxconn. 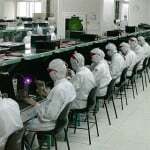 In response to the expected high demand for the iPhone 6, both Pegatron and Foxconn went on hiring sprees for additional employees to help assemble the device at their factories in Taiwan. According to a report yesterday from Chinese media, the iPhone 6 is nearing completion of its testing phase and is anticipated to enter mass production very soon. As for Apple’s next generation tablets, according to a recent report from Bloomberg, production has begun on the so-called “iPad Air 2″ and “Retina iPad mini 2″ at Apple’s suppliers, which likely include Pegatron.